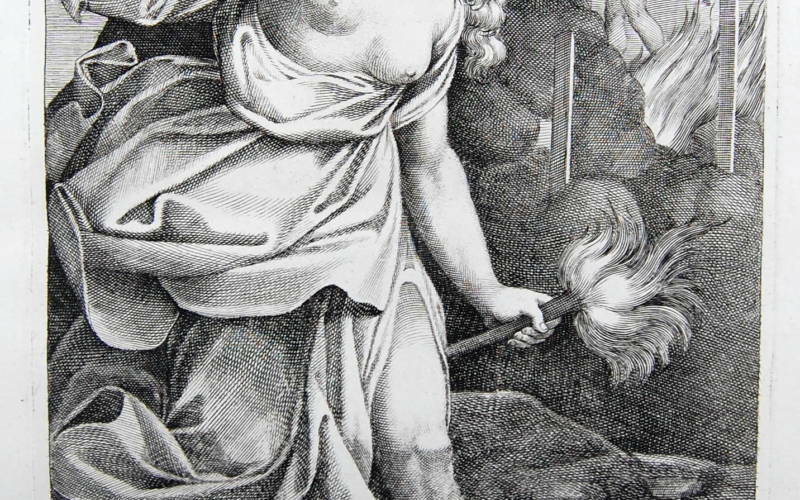 Thaïs was an Athenian courtesan who accompanied Alexander the Great on campaign when he conquered Persia. 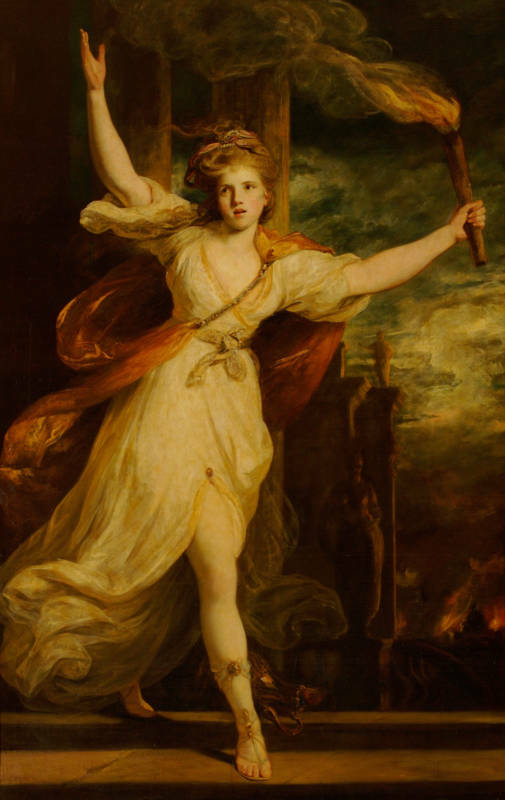 She is reputed to have persuaded him to set fire to the palace of Persepolis in 331 BCE. Reynolds’s painting quotes Raphael (1483-1520) and Ludovico Carracci (1555-1619), demonstrating his ability to adapt the conventions of high art to create new works that could compete with the most illustrious masters. 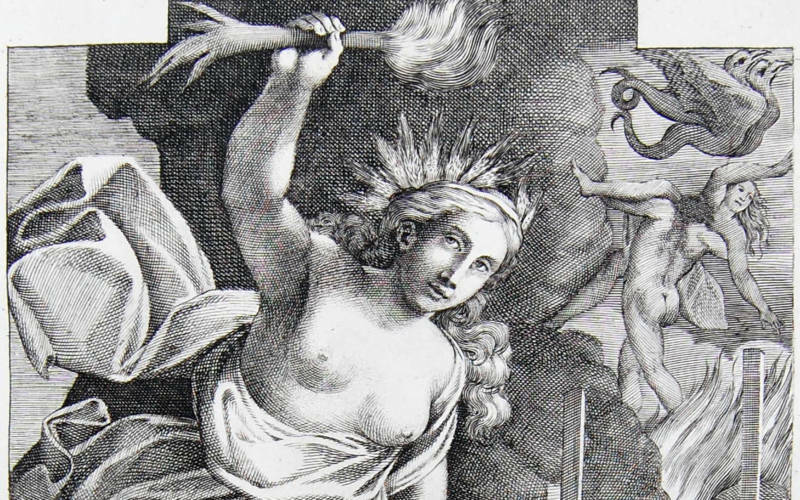 Reynolds subverts the subject matter of the Italian paintings that his Thaïs recalls. 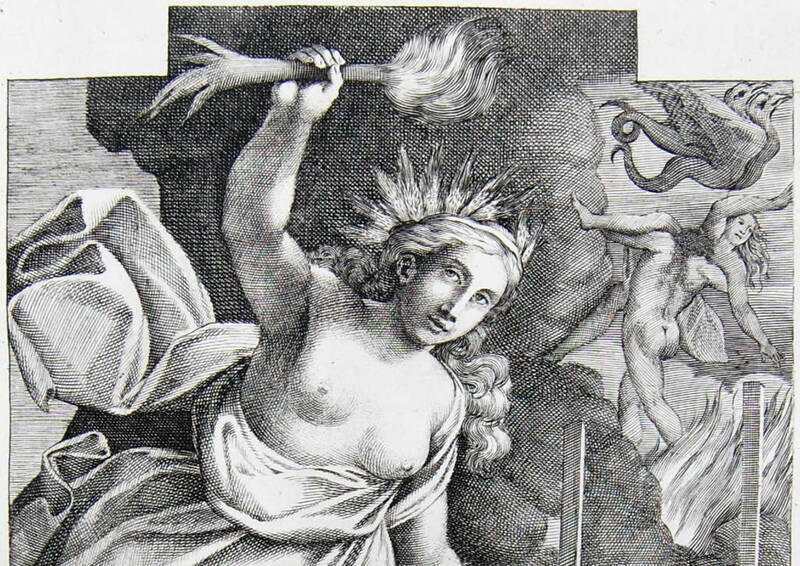 Carracci’s Ceres, the goddess of fertility, raises a torch to light her way. Thaïs is a destroyer. 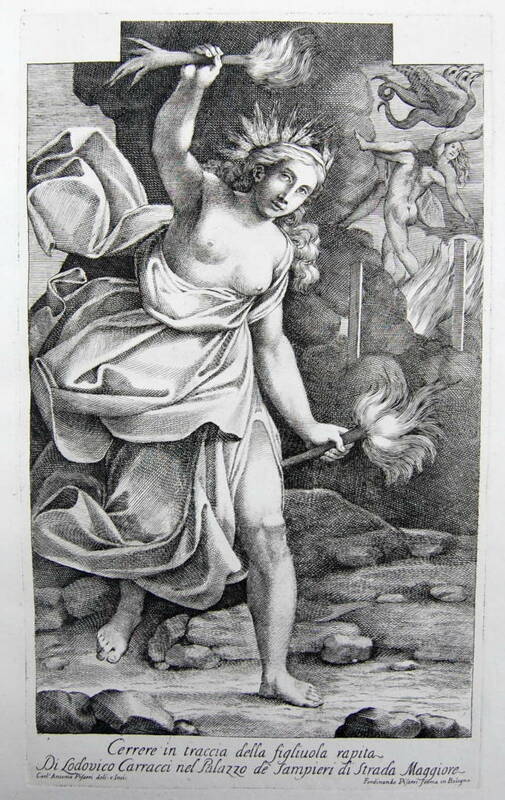 In Raphael’s The Fire in the Borgo, the woman seen from the back, with her arms thrown up in horror and a tress of hair blowing to one side, is the horrified witness to a fire, whereas Thaïs, adapted from this figure and turned towards us, is the perpetrator. Dynamic and sculptural, Thaïs strides forward, fires burning behind her. The reflective surfaces of the ewer overturned at her feet, the jewels on her clothes and the fastenings of her sandals reflect the firelight and intensify the drama of light and dark in this night time piece. The caryatid figure wearing vaguely Asian-style trousers was probably intended to give authenticity to Reynolds’s imagined version of Persepolis, of whose appearance Europeans knew little. The dome in the background is more like Rome than the ancient Achaemenid palace. 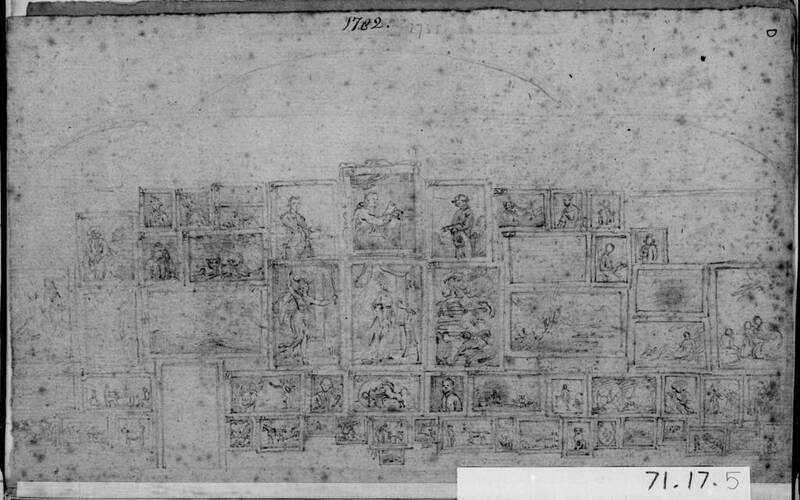 A drawing shows Thaïs hanging in a prominent position in the Great Room at the Royal Academy exhibition of 1781. The model for it was recognised by the public (and gossiped about in the press) as the contemporary courtesan, Emily Warren (also known as Emily Coventry, Emily Bertie and Emily Pott). According to a friend of Reynolds, the artist ‘often declared every limb of hers perfect in symmetry, and altogether he had never seen so faultless and finely formed a human figure.’ The painting was paid for by one of her admirers Charles Greville, the son of the Earl of Warwick, although they parted company soon after the painting was begun. It is worth considering how a painting such as this could flatter its patron as much as amuse its wider audience and promote the ambitions of the artist. Emily as Thaïs implicitly casts Greville as Alexander the Great.